Srinivasa Ramanujan was one of the India’s greatest mathematical geniuses. He made substantial contributions to the analytical theory of numbers and worked on ‘elliptic functions’, ‘continued fractions’, and ‘infinite series’. 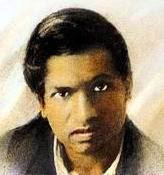 Srinivasa Ramanujan was a great Mathematician, who became world famous at the age of twenty-six. He was born on December 22, 1887 in his grandmother’s house in Erode, a small village of Chennai, Tamilnadu, India. He was the son of K. Srinivasa Iyengar & Komalatammal. His father worked in Kumbakonam as a clerk in a cloth merchant’s shop and his mother was a housewife and also sang at local temple. 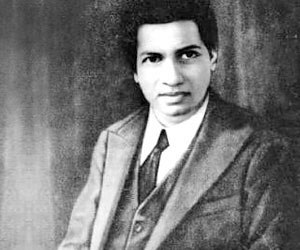 When Ramanujan was a year old, his mother took him to the town of Kumbakonam, near Chennai. 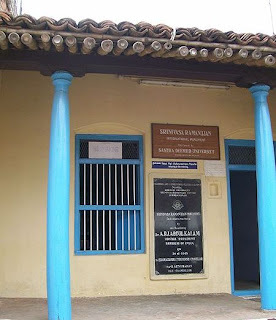 Ramanujan's home on Sarangapani Street, Kumbakonam.